Each course (no matter the length) costs US$500 per participants which includes hotel accommodation with breakfast, lunch, airport pick up, course materials and handouts. Payment needs to be made to CPCS in advance. Courses run with a minimum of ten participants. THE PEACE RESEARCH METHODOLOGY COURSE is based in values, theory and practices that support peace and reconciliation, but like other research approaches in the social sciences, is grounded in scientific inquiry. 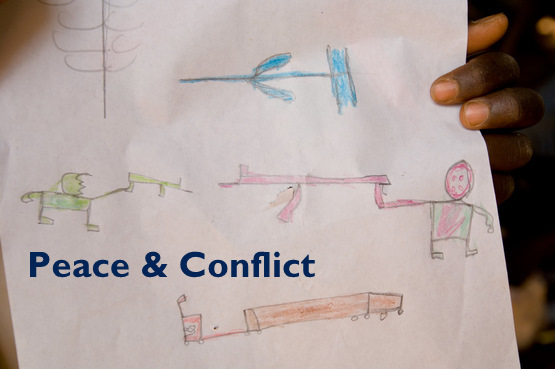 The course has been developed to teach, in a simple and practical way, how to understand the main ideas that guide research in the study of peace and conflict and support the development of active research amongst young practitioners. The PRMC provides an opportunity for people without an academic background in social sciences or research, to develop a foundation level understanding from which peace research skills can be developed. Past participants found the PRM course topics useful and comprehensive in providing an overall understanding of the peace research process as well as being applied through exercises at each stage of the process. A basic grounding in the theoretical, conceptual and empirical foundations of research methods for the social sciences. An understanding of foundational concepts and theories in peace studies and peace research. A grounding in the main research processes with a focus on developing a research proposal. Opportunity for further future professional research activities via research networking. As a Cambodian peace activist and researcher, Soth Plai Ngarm has worked throughout South East Asia with particular focus on post-conflict issues, nationalism and ethnic identity. He is the co-author of the manual Peace Research Methodology, a faculty member of the Applied Conflict Transformation Studies MA program and is the Cambodian National Coordinator of the South East Asian Conflict Studies Network (SEACSN). Ngarm was also a founding member and director of The Alliance for Conflict Transformation (ACT), a Cambodian NGO working towards combating violence and addressing root causes of conflict. Ngarm holds a Masters degree in Peace Studies from the University of Bradford, UK. Tania Miletic, a peace practitioner and researcher from Australia, is a senior consultant and researcher with CPCS. In particular she designed the Centre signature course on peace research and co-authored the book Peace Research Methodology. Since 2006 she has also served as an advisor and faculty member on the Applied Conflict Transformation Studies (ACTS) Masters course. Tania has worked for several years on community-based peacebuilding and transcultural mental health initiatives locally and across the Asia Pacific region. Tania holds a Postgrad Dip in Psychology from the University of Melbourne; an MA in Public Administration (Int. Studies in Peace and Conflict Resolution) from ICU, Tokyo and is a PhD candidate. RPP is an experience-based learning process that involves agencies whose programs attempt to prevent or mitigate violent conflict. Its purpose is to analyze experience at the individual program level across a broad range of contexts, with the goal to improve the effectiveness of international peacebuilding efforts. It is both a framework and a methodology, designed to evaluate the effectiveness of different peace programs with specific reference to the context or culture in which it operates. RPP is about reflection and practice. What are we learning from our experience? How does our experience compare with that of other practitioners? What generalizable lessons can we learn and disseminate? The lessons comprise a set of tools and concepts that are most useful for conceptualization and planning of peace interventions at all levels.
? What should we work on? Which of the issues or conflict factors is a priority?
? Whom should we work with? Which actors/stakeholders are most important?
? Why should we work on that issue with those people? Is the rationale for our chosen approach solid? Tulasi Ram Nepal holds an MA in Rural Development (2000) from the University of East Anglia, UK, and an MA in Applied Conflict Transformation Studies (2007) from Pannasastra University, Phnom Penh, Cambodia. Tulasi has more than a decade of experience working with development projects in Nepal in various capacities – at local, regional, and national levels. He has worked closely with the Ministry of Local Development and its department during his assignment with Helvetas, a Swiss NGO working in Nepal. Tulasi also gained experience working with International Alert in Nepal as a Senior Programme Officer. His primary areas of responsibility in Alert were Justice and Security, and Promoting Peacebuilding Practices, a local capacity building initiative. Currently, he is working with CPCS as South Asia Programme Manager. The Fundamentals for Peace and Conflict Work (FPCW) s an introductory course for people who are working n the field of conflict and peace issues, and want to examine or deepen their individual commitment toward peaceful social change. 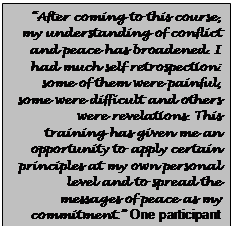 The course explores theories and praxis with focus on the disciplines of conflict, peace and violence. Baht is a widely experienced trainer/facilitator and consultant in the field of nonviolence, conflict transformation, and peacebuilding. He has served as a course tutor with Responding to Conflict, UK, leads workshops throughout Asia, and was the Deputy Director of AKKAPKA Foundation for more than 5 years — a social change organization espousing active nonviolence in the Philippines. He served as the Steering Committee Chair of ACTION-Global from March 2002 until October 2007. From 1997 to present, Baht has been a faculty member of CONTACT, a summer institute at the School for International Training in Vermont, USA; he is also an Associate Member of Karuna Center for Peacebuilding, Amherst, Massachussetts. Monica Alfred is a specialised trainer, coach and consultant in peace and conflict transformation studies and psychosocial support programmes. She is one of the first Rotary World Peace Scholars from Sri Lanka; she holds a Masters in Philosophy from the University of Bradford, United Kingdom, and a Master of Arts from the same University having written her thesis on Peace and Psychosocial Education for Children Effected by Armed Conflict. In general she combines education and training in conflict transformation, peace and psychosocial support with her work in teaching, writing and training with her focus on building a peaceful society. Over the last fifteen years she has been involved in peacebuilding, conflict transformation and psychosocial work in Sri Lanka from local to national levels. This short course uses recognized tools and frameworks for conflict transformation to organizations. It particularly looks at the types of conflict organizations face at different stages of their development. The course will look at strategies for handling intra organizational conflict especially leadership, communication and decision making styles. It will also contrast the strengths and weaknesses of these styles. The course combines theoretical approach, and practical exercises.